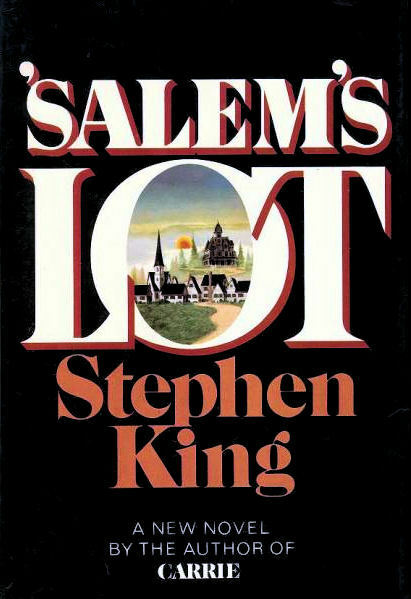 'Salem's Lot is a 1975 Horror fiction novel written by Stephen King. It is set in the same location as "Jerusalem's Lot", a short story from Night Shift, and was the author's second published novel. The title King originally chose for his book was Second Coming, but he later decided on Jerusalem's Lot. The publishers, Doubleday, shortened it to the current title, thinking the author's choice sounded too religious. They also undertook a last minute price change, reducing the cost of the book from $8.95 to $7.95, thereby producing what some call the 'holy grail' for serious Stephen King collectors as perhaps no more than 4 such copies of the unchanged dust-wrapper exist. Salem's Lot has been adapted into a television mini-series twice, first in 1979 and then in 2004. It was also adapted by the BBC as a seven part radio play in 1995. The novel was nominated for a World Fantasy Award in 1976.